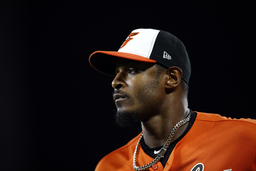 SCOTTSDALE, Ariz. (AP) Adam Jones had been climbing Camelback Mountain and hitting at Grand Canyon University for the past two weeks, waiting for a major league team to give him a job. On Tuesday, he officially joined the Arizona Diamondbacks, the only team that Jones says showed any real interest in the 33-year-old outfielder. A free agent after playing the last 11 seasons with the Orioles, Jones signed a one-year, $3 million contract with the D-backs. "I was in San Diego and a lot of the baseball players I trained with, they all came to spring training," Jones said. "I'm sitting there looking around at the stars. It made sense to come here and be with my friends who are unsigned. I've been out here working out with the guys who are still looking for jobs." Other players voiced their support of Jones on social media, including Arizona outfielder Steven Souza Jr., who posted on Twitter: "How does Adam Jones not have a job right now, you can't tell me this man doesn't help anyone's ball club?!" "It was very humbling," Jones said of the support. "I've played a lot of major league baseball games and against a lot of guys and the lasting relationships I've had throughout the game and the All-Star teams, it's great that guys have my back. I've been a formidable force in the game. I know last year wasn't the greatest year but it happened and I'm just glad to turn the page. I've got a new opportunity here so let me go try and maximize my opportunity." Jones batted .281 with 24 home runs and 93 RBIs in 145 games with the Orioles last season and his defensive statistics showed a decline. Was his value hurt because he didn't grade well with the analytics folks? "I don't know," Jones said. "All I know is that between the lines, I know I can play. That's all to me personally that matters is that I know I can play between the lines. I know I can hit a fastball, I know I can hit a breaking ball." Arizona outfield coach Dave McKay already has been working with Jones regarding their defensive game plan. Before Jones arrived, the D-backs' projected outfield was Ketel Marte in center, David Peralta in left and Souza Jr. in right. Marte is making the switch from the infield to the outfield. "I don't worry about all that kind of stuff, the analytical stuff, when I'm playing," Jones said. "If a ball is hit, I try to get to it as quick as possible and get it back in." The Marlins showed some interest but Jones said "the only team that stepped up was Arizona." A four-time Gold Glove winner and five-time All-Star, Jones said he wasn't frustrated as spring training began and he was still looking for work. "I think other guys were more frustrated than myself," Jones said. "It's a process that a lot of people went through last year and the year before. It's an unfortunate situation, especially for guys over 30 who I believe still have a lot in the tank, a lot to offer this game. You just have to have faith that somebody will give you the opportunity." Now that he's in the NL West, Jones will have the chance to see his former Orioles teammate, Manny Machado, who signed with the Padres. Jones also will be closer to his San Diego home. Jones was happy to be back in the Phoenix area, where his mother moved when he started his big league career with the Seattle Mariners in 2006. She hasn't seen him play a spring training game for 12 years. Jones isn't moving home completely. "I'm not living with mom," he said. "We're going to make sure to make him feel like family," Peralta said. "Something good is going to happen. We're going to surprise a lot of people. I'm really excited with what we have right now. I was excited before and now we got this guy and I'm even more excited." How soon will Jones get on the field? He expects to do a lot of work on the back fields to catch up. "I'm in shape, I just need the at-bats and to see the ball off the bat," Jones said. "I'm happy to have the opportunity to continue to play baseball. A lot of guys aren't having it, so I'm just happy the situation worked out perfectly here."